It's official, we are less than one week away from the Olympics. And, while we're all psyched for three weeks of cheering, competition, and a shirtless Ryan Lochte, brit-brand Topshop is really getting into the festivities. In celebration of all things Anglophile (and that ultra-cool U.K. style), they'll be hosting an all-out bash next weekend. In addition to awesome in-store giveaways, freebies, and a DJ holding down the fort, they're sending out a fashion truck around the city. The style stop on wheels will be hitting up key locales to hand out Brit-tastic sunnies and gift cards. Plus, a photog will be on board to snap the best street-style stars. 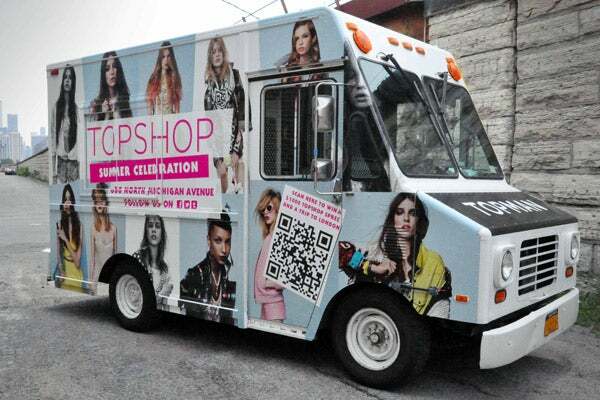 Follow @Topshop and #topshopchicago to track the truck and all its ex-pat fans. Cheers, guvnah! Where: Topshop, 830 North Michigan Avenue (between Pearson and Chestnut streets); 312-280-6834.